Golden Lighting's Hidalgo 1 Light Bath Vanity in Sovereign Bronze offers transitional style Transitional style / Ideal for Mediterranean inspired decors / Spanish-influenced design with strong and clean lines / Opal Glass creates a soft glow / Warm Sovereign Bronze finish complements both modern and rustic decors / Popularly used in halls, stairways, entries and as an accent. 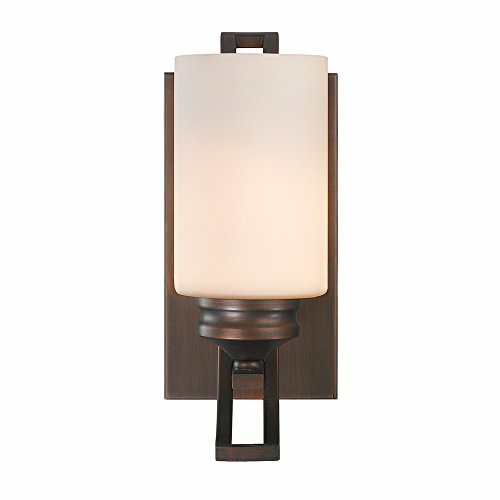 Mounting Direction: Up/Down / Shade Included: TRUE / Room Style: Bath/Living/Hall/Accent. Back Plate Width: 4.75" - Back Plate Length: 8.88"
If you have any questions about this product by Golden Lighting, contact us by completing and submitting the form below. If you are looking for a specif part number, please include it with your message.